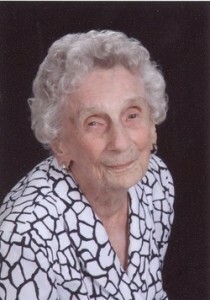 Doris Alzada Henderson McNeely Segrest, 105, died October 9, 2012 at her son’s home in Havana, FL, after several debilitating strokes in recent months. She was born in Murray, Iowa, on December 13, 1906. In 1910 she and a portion of her extended family immigrated to Wayne County, Georgia. Those moving included her parents, Martin W. And Nellie Henderson; brother, Roy D. Henderson; maternal grandparents, Albert and Lucetta Bray and uncles, Maurice Bray, Frank Bray and Leonard Bray, all now deceased. roadside. River floods, lack of paved roads and no developed campsites insured an uncomfortable but exciting trip for the young lady. After graduating high school she taught school two years in the Madry Springs- Red Hill area of Wayne County. In 1927 she married James T. McNeely ( Jim Tom ). A son Jimmie Wade, was born in 1928 and a daughter, Patsy Jane was born in 1932. The family moved to North Charleston, SC, in 1941, where Martin Rex, 1942 and Fred Bern, 1944 were born. Jim died in 1957. She married Marion R. (Bob) Segrest in 1985; he died in 1989. Doris lived in North Charleston until 1985 when she moved to Hanahan, SC. In 2009 she moved to Havana, FL., to be with Jimmie and Evelyn. Reading, traveling, senior citizen activities and corresponding with a wide range of individuals were major interest of Doris. Her abiding faith, trust and involvement were guiding factors in her daily walk with the Lord. Travel adventures include driving to California in 1959 with assistance only of a 15 year old son with a learners permit; taking a six week bus tour to Alaska in 1983; touring four weeks in eight western European countries in 1992 and, in 2010, at 103 years, being caught in a late season snow storm in New Mexico. Spending a night in an emergency shelter with several dogs, four cats and 80 other individuals added to the drama. The latter two adventures were with family members. Doris is survived by four children and numerous grandchildren: Jimmie ( Evelyn), Havana FL; Patsy ( Richard ) Dempsey, Chatsworth, CA; Rex ( Jan ) Meggett, SC; Fred ( Linda ), Northridge, CA; nine grandchildren, and 12 great-grandchildren. She was loved and she will be greatly missed by both family and friends. A private burial service will be at the Jesup City Cemetery, Jesup GA, where she will be buried adjacent to Jim Tom. A memorial service will be held at a later date at Northside Baptist Church, North Charleston, SC, where she was an active member.